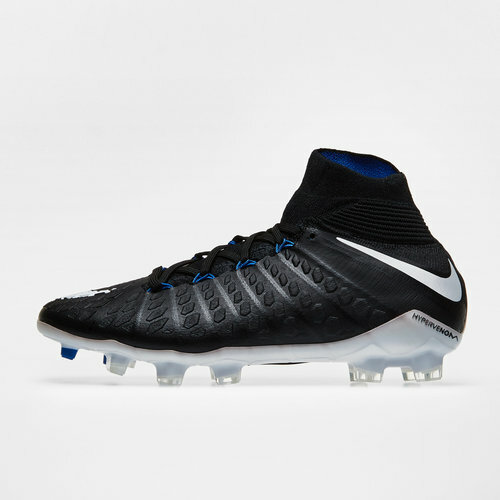 As eye-catching in design as they are technically advanced, let your kid pull on these Nike Hypervenom Phantom III Dynamic Fit Kids FG Football Boots in a Black, White and Game Royal colourway. 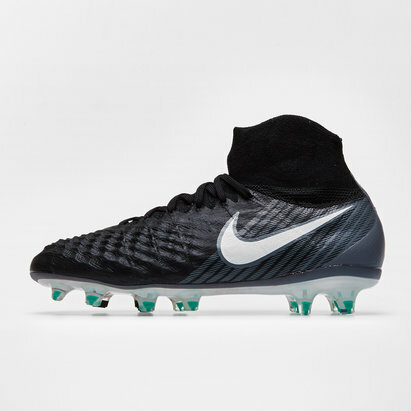 Fresh from the Nike Pitch Dark Pack and forming part of the Hypervenom collection these top quality boots have been designed for players and delivers a high performance game after game. The design of the boot has a strong emphasis on scoring, evident with a lightweight synthetic upper featuring Flywire technology which sees the lower four lace holes on the outstep replaced by loops, complimented by offset lacing which gives a greater striking surface, this gives a more lockdown feel. Players will also notice a different cut to the Dynamic Fit Collar, which has been redesigned with players ankles in mind, providing a greater lateral stability. Optimised for firm ground pitches, these Hypervenoms have a soleplate combines moulded hexagonal studs enable players to push off and rotate at speed whereas the sidewall chevrons improve lateral and medial traction.